Da Nang Quan highlights the bold, earthy flavors of the central Vietnamese coast. The bun bo Hue was rich and deeply flavorful. Hours: Thu.-Tue. 9 a.m.-8 p.m.
What Americans talk about when they talk about Vietnamese food is mostly pho, with a little bit of banh mi thrown into the mix. So it should come as no surprise that when it comes to the nuances of Vietnam's regional cuisines — say, how the food in Central Vietnamese cities such as Hue and Da Nang differs from that in Hanoi to the north or Saigon to the south — many of us draw a blank. You can also get your hen piled on top of steamed rice — which makes for brilliant comfort food — or you can order a heaping platter of the little clams by themselves and scoop them up with big shrimp chips, like oceanic nachos. Open since last August, Da Nang Quan is a bright, modern-looking restaurant as far as the spectrum of tiny Southeast Asian eateries on this stretch on East 12th Street goes — nothing fancy about it, but pleasant and inviting. The kitchen is headed by Da Nang native Mot Le, who told me that he never cooked in Vietnam but instead honed his craft mostly just by eating out widely and looking up recipes on the internet. 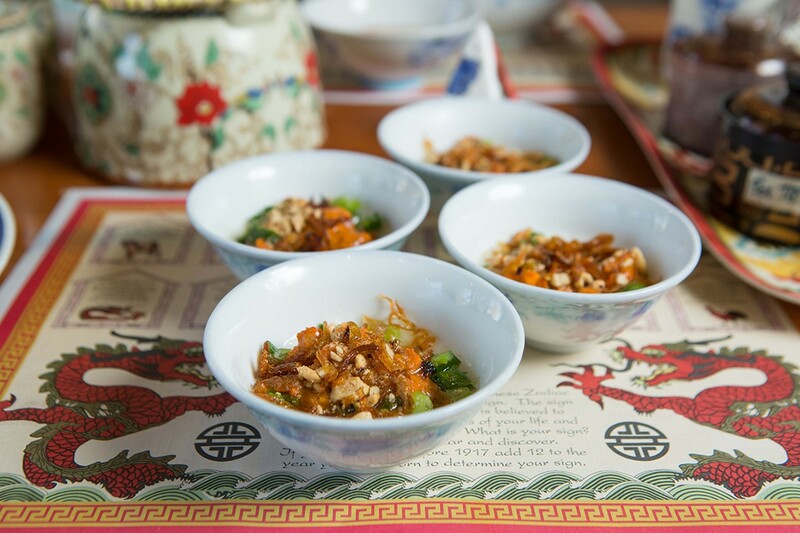 You wouldn't think it from tasting Da Nang Quan's best dishes, which have a homey depth of flavor that I associate with long-cherished recipes passed down by someone's grandmother. The menu may be daunting to newcomers to the cuisine, who might find themselves grasping for a familiar name in the absence of the usual array of phos (save for a single chicken-broth version), grilled pork chop rice plates, and other standards of the one-size-fits-all Vietnamese restaurant repertoire. But it's easy to put together a great meal of Central Vietnamese specialties. Start with an order of bun beo — rice cakes that have been steamed in individual-size bowls, four to an order. A specialty of Hue, the rice cakes had a sticky chewiness that reminded me somewhat of German spaetzle, and came topped with fried shallots, an orange-tinged mixture of ground pork and shrimp, and a drizzle of a very light, refreshing fish sauce dressing. It's a good dish to prime your appetite. After that, you'll want to get some noodles, and even if you don't like clams, you'll have no shortage of options. 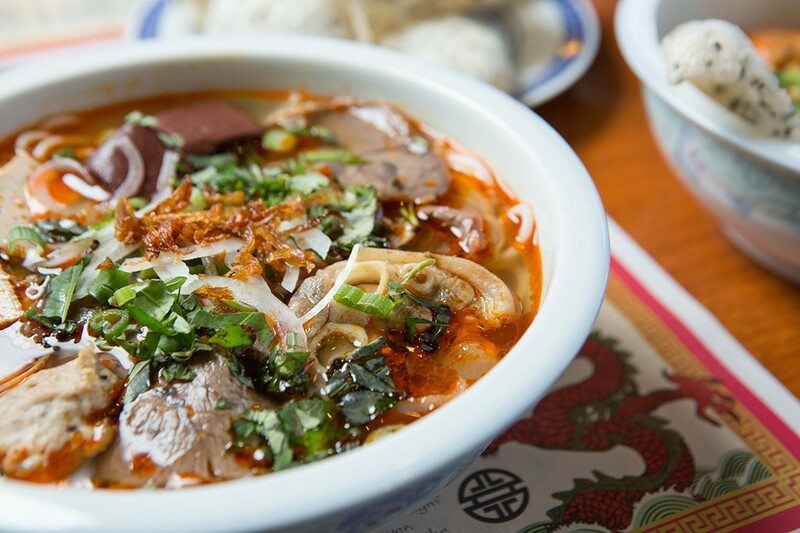 While it seems like every Oakland noodle lover has a favorite neighborhood pho joint, the list of contenders for what is probably Vietnam's second most famous beef noodle soup, bun bo Hue, is quite a bit shorter. I humbly submit Da Nang Quan's version for your consideration. The defining characteristic of the bun bo Hue beef broth is its heavy dose of lemongrass, and Le said he makes his bun bo in the style that's popular in Da Nang — with less chili oil and even more citrusy lemongrass. The result is a rich, deeply flavorful, clean-tasting broth that you can spike, to your own taste, with chili sauce and shrimp paste. The other great thing about bun bo Hue is the variety of toppings in the soup, which at Da Nang Quan included thinly sliced beef shank, pork meatballs, pork patty, cubes of pork blood, and a whole pork knuckle — an old school addition whose chewy, gelatinous bits I spent several minutes gnawing on with great relish. Most everything on the menu is significantly less than $10 — the only exception being a couple of grilled game options that you'll usually only find at more formal sit-down Vietnamese restaurants. For a still exceedingly reasonable $18, you get a big platter of bright-red, thinly sliced raw deer or wild boar, garnished with slices of raw onion, chili peppers, and chopped lemongrass. You can have the kitchen cook the meat for you ahead of time, or you can grill it yourself on a little tabletop grill, Korean barbecue-style. The idea is to wrap the meat up with fresh herbs and lettuce, and then take a round of rice paper, dipping it in lukewarm water to soften it so that you can wrap the whole thing up like a little burrito. It's the type of celebratory dish that's meant for special occasions, I'm told. Though there's nothing stopping you from ordering a big spread of deer meat as we did, on a random Sunday morning, just because we were feeling flush and because we wanted to try something new.